The way some people use bacon to fix food or myriad other situations, I add sweet potatoes. So here’s a quick weeknight healthy vegan dinner that would make Aunt Nettie proud. To round out the meal, you can serve this over rice or quinoa, wrapped in a tortilla, or as a topping for a large open-face sandwich. 1. Preheat oven to 375 degrees. In pot large enough to fit the greens, heat 1 TBS oil over medium high heat and sauté the garlic and onions with the red pepper flakes until soft, stirring and making sure they do not burn. Add 2 cups of water, bring to a boil, and add greens and pinch of salt. Turn heat to low and cover. Cook for 20 minutes or until greens are soft. 2. While greens are cooking, put 2 tsp olive oil on baking sheet, toss with the sweet potato cubes, thyme, and salt, and put in the oven. Toss after 10 minutes and roast another 10-12 minutes until soft when poked with a fork. 3. While greens and sweet potatoes are cooking, stir the harissa and 2 TBS of olive oil in a small bowl. 4. When greens are done, remove them with a slotted spoon and put them in a large serving bowl. Add the sweet potatoes, harissa sauce, raisins, and beans, and toss, and add salt and pepper to taste. Serves 4-6 as a side dish or main dish along with grains. 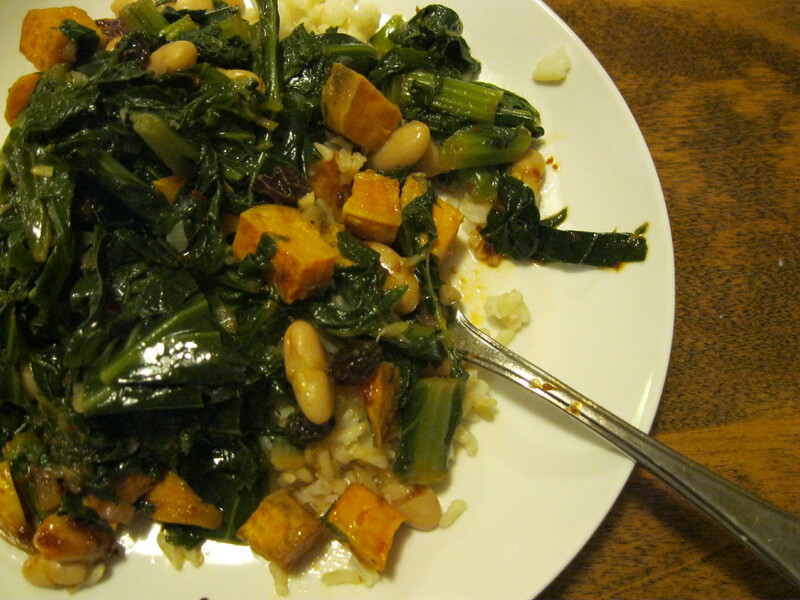 This entry was posted in Beans and legumes, Comfort food, Healthy, vegan, vegetables, vegetarian and tagged fast vegan dinner, how to cook with collards and mustard greens by Amy. Bookmark the permalink.